When Rosemary Mahoney, in 1998, took a solo trip down the Nile in a seven-foot rowboat, she discovered modern Egypt for herself. As a rower, she faced crocodiles and testy river currents; as a female, she confronted deeply-held beliefs about foreign women while cautiously remaining open to genuine friendship; and, as a traveler, she experienced events that ranged from the humorous to the hair-raising--including an encounter that began as one of the most frightening of her life and ended as an edifying and chastening lesson in human nature and cultural misunderstanding. Whether she's meeting Nubians and Egyptians, or finding connections to Westerners who traveled up the Nile in earlier times--Florence Nightingale and Gustave Flaubert among them--Mahoney's informed curiosity about the world never ceases to captivate the reader. 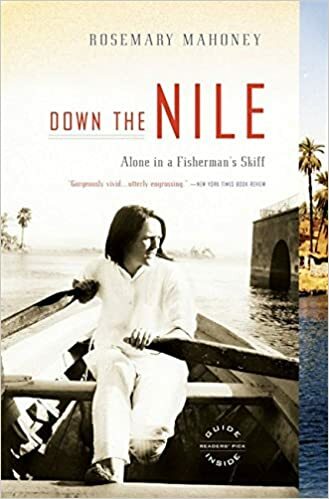 "Mahoney, who has been rowing for 10 year, brilliantly juxtaposes an account of her own palm-blistering hours on the Nile....with the diary entries of two Victorian travelers-Gustave Flaubert and Florence Nightingale."